Storming The Floor looks at last night's NIT championship game. Before they do, however, we'd like to point something out: We never had any idea that teams cut down the nets after winning the NIT. We suppose it makes sense, but still. All right, to Storming The Floor now. Stop the presses! Ohio State has won a championship! This is like the Red Sox ending the Curse of the Bambino! Or at least like Susan Lucci finally winning a daytime Emmy. Clearly, the rioting and overturning of cars will continue unabated in Columbus until Monday. Clearly, the secret is to not face an SEC team in the final. 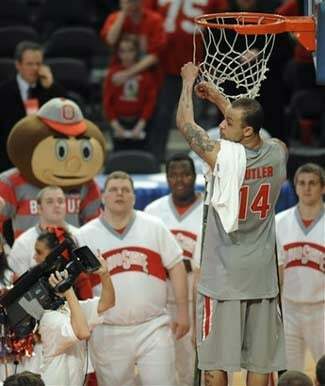 And having Jamar Butler go buck wild helps, too. Butler had 19 points and 8 assists to make damn sure the Buckeyes didn't go home empty-handed this season. Seven-foot freshman Kosta Koufos poured in 23, a total he only exceeded once this season, and that was way back in November. Something tells me these guys will be back in the Big Dance next March. Memo to Thad Matta: ask yourself, What Would Huggins Do? If Tulsa vs. Bradley is the championship game nobody ever wanted to see, the brilliant decision to turn it into a three-game series must have driven viewership into the negative digits. This is like the college basketball version of "Groundhog Day", where two coaches wake up every morning and prepare for the same team again, and when they finally break the cycle tonight, nobody will know or care about their triumph. Then again, if I ever get my wish to write a Trivial Pursuit card, you can expect a question about who won the first and only College Basketball Invitational.